Map showing the planned route of NOAA Ship Okeanos Explorer, shown in yellow, and the planned operations area for the expedition, outlined in white. Image courtesy of the NOAA Office of Ocean Exploration and Research. Download larger version (jpg, 2.3 MB). 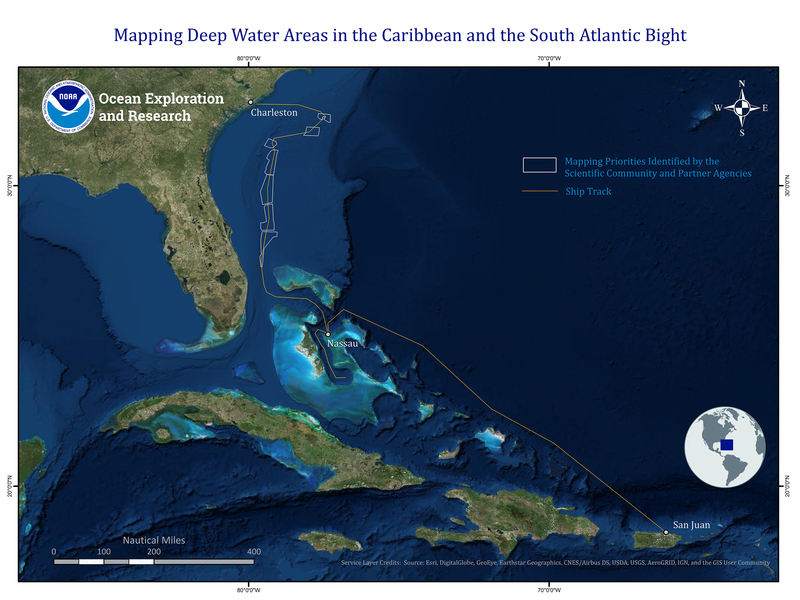 From November 28 to December 16, 2018, the NOAA Office of Ocean Exploration and Research (OER) and its partners will complete the Mapping Deepwater Areas in the Caribbean and South Atlantic Bight expedition on NOAA Ship Okeanos Explorer. During 19 days at sea, while transiting from San Juan, Puerto Rico, to Charleston, South Carolina, 24-hour per day operations will consist of telepresence-enabled mapping and remotely operated vehicle dives (ROV) in support of ocean exploration and federal agency and scientific community needs. Operations will focus in the U.S. Exclusive Economic Zone, Bahamas, Dominican Republic, and Turks and Caicos Islands. During the first part of the expedition, while transiting from Puerto Rico to the Bahamas, OER and NOAA Ship Okeanos Explorer will host four undergraduate students and a professor from the University of Rhode Island who will be testing the application of 3D printing at sea. They will investigate how their resin-based 3D printer performs when subjected to at-sea motion and how to compensate for this motion. Resin-based printing like this has never been conducted at sea before and results from the testing will help further refine the technology. In the future, one potential application of this kind of 3D printing could include fabrication of critical parts while a ship is deployed at sea, eliminating the need to return to port. Strategic transit mapping during this part of the expedition will target poorly mapped areas that are likely to exhibit interesting terrain with potential seamounts and deepwater ridges. Exploration in the Bahamas will include mapping and ROV dives in support of community and partner agency needs. OER will work with the University of New Hampshire Center for Coastal and Ocean Mapping (UNH/CCOM) to deploy a hydrophone array in order to characterize the sound patterns of the EM302 multibeam echosounder. The EM302 can be described as the bread and butter of ocean exploration mapping operations, as the data it collects leads to high-resolution maps and images of the seafloor and water column. This project will help the scientific community understand how sound emitted from the EM302 sonar travels through the water column, an important aspect in understanding multibeam data and the potential to change the ambient environmental soundscape. After departing the Bahamas for the second part of the expedition, the Okeanos Explorer will transit to the South Atlantic Bight to conduct 24-hour per day mapping operations. These operations will focus on scientific community and partner agency mapping needs in the region, including those identified during a recent workshop focused on the Atlantic Seafloor Partnership for Integrated Research and Exploration, or ASPIRE, campaign. ASPIRE is a major multi-year, multi-national collaborative ocean exploration field program focused on raising collective knowledge and understanding of the North Atlantic Ocean. The campaign will provide data to inform and support research planning and management decisions in the region. OER’s newest Physical Scientist/Mapping Lead and former Explorer-in-Training Shannon Hoy will also be sailing during the expedition, learning her roles and responsibilities as a Mapping Lead and Expedition Coordinator. Shannon will graduate from UNH/CCOM shortly and brings years of at-sea and technical expertise to her new position—glad to have you onboard!